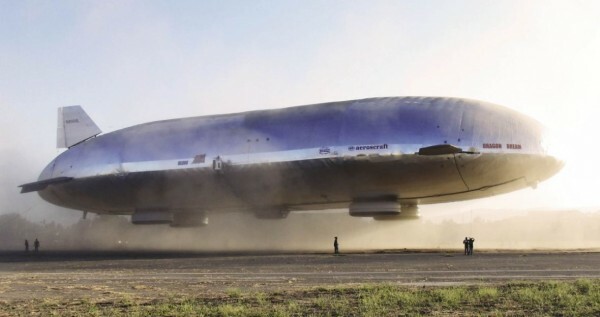 Once operational, the U.S. military version of the Aeroscraft semi-rigid hull hybrid airship funded by DARPA will be the largest aircraft to take to the skies in the past eight decades. The U.S. Air Force's battlefield cargo airship being built by Worldwide Aeros Corp. based in California will be 169 meters long and capable of carrying from 66 tons to 500 tons, depending on which model is used. The military Aeroscraft will have a range of some 3,000 miles and, more importantly, won't need a runway to land on. The military value of an airship is its ability to carry extremely heavy and outsized cargo and to land in the most primitive of conditions while hovering like a helicopter. When it enters service, the USAF Aeroscraft might revolutionize the U.S. military's battlefield deployments by giving the USAF the ability to move large loads into areas without a runway. The U.S. military is the largest customer for the Aeroscraft, hardly surprising since the U.S. Defense Advanced Research Projects Agency (DARPA) invested over $58 million dollars to ensure the success of Aeroscraft. Of this total, DARPA spent $50 million so Aeros could build "Dragon Dream," a test airship half the size of the original. Dragon Dream first took to the air on July 4, 2013 and the Pentagon declared the first float of the airship a "success" since it met its demonstration objectives. In comparison, the Lockheed C-5M Super Galaxy, the USAF's largest transport aircraft, can lift over 140 tons of cargo, including two M1 Abrams tanks. The largest operational airships were Germany's two Hindenburg-class zeppelins that flew in the late 1930s. The most famous ship in this class, the ill-fated LZ-129 Hindenburg, had a length of 245 meters or 802 feet. It was destroyed in a spectacular fireball over New Jersey in 1937.